The Public Library of the Year award is conferred by the International Federation of Library Associations and Institutions (IFLA) and sponsored by Systematic A/S, the largest privately owned software company in Denmark (https://www.systematicinc.com/) . The award is presented to the best public library for either a newly created building or an existing one that has been remodelled to house a public library. A library has to have been opened in the last three years to be considered for the award. What makes this award different is that it combines architecture and quality of library service in a single award. Only in its fourth iteration, the award is gaining remarkable momentum and visibility. The future of the award looks promising. This article tracks the evolution of the award and includes images and commentary on the five nominees for the 2018 award. The award was initiated in 2014 and organized in cooperation with the Danish Agency for Culture and Palaces (DAC). It was sponsored by Schmidt Hammer Lassen Architects (https://www.shl.dk/) and the panel of judges included members of the IFLA Public Libraries Section. The 2014 award, won by the Craigieburn Library in Australia, was presented at the IFLA World Library and Information Congress in Lyon, France. (https://www.humelibraries.vic.gov.au/Locations_amp_Hours/Libraries/Craigieburn_Library); https://modelprogrammer.slks.dk/en/news-events/public-library-of-the-year-previous-years/public-library-of-the-year-2014/#c123451. The 2015 and 2016 awards, sponsored by the IT company Systematic, were also organized with the collaboration of the DAC. The IFLA Public Libraries Section was again represented on the judging panel. In 2015, the IFLA World Library and Information Congress was hosted in Cape Town, South Africa, where the winner of the award was the Kista Public Library in Sweden (https://biblioteket.stockholm.se/bibliotek/kista-bibliotek; https://modelprogrammer.slks.dk/en/news-events/public-library-of-the-year-previous-years/public-library-of-the-year-2015/#c123450 ). In 2016, the IFLA World Library and Information Congress was held in Columbus, Ohio, USA, where the prize was awarded to the Dokk 1 Library in Denmark (https://dokk1.dk/;https://modelprogrammer.slks.dk/en/news-events/public-library-of-the-year-2016/ ). No award was made in 2017. In 2018, the award came under the umbrella of IFLA, and will be sponsored by Systematic under a five-year sponsorship agreement (https://systematic.com/library-learning/nyheder/2018/public-library-of-the-year/). The judging panel is made up of seven Standing Committee members from three Sections of IFLA: the chair and two members of the Public Libraries Section, two members from the Metropolitan Libraries Section and two members from the Library Buildings and Equipment Section. One of the members from the Library Buildings and Equipment Section is an architect, which helps with assessment of the architectural features of libraries competing for the award. The four or five finalists chosen from the entries submitted receive a certificate. The winning entry receives a prize of US $5,000 . All finalists are required to deliver a presentation at the awards ceremony held at the annual IFLA World Library and Information Congress. The Public Library of the Year Award recognizes the best public library of the year, evaluating the architectural quality of the library building as well as such diverse aspects as local culture, sustainability, digital developments, and the wishes and needs of library users. Interaction with the surroundings and local culture, including how the architecture reflects or gives consideration to the local culture of the community and how it provides visibility in the urban landscape and interaction with surrounding buildings and open spaces. Architectural quality, including how each space works in terms of functions and logistics, how the architectural concept is implemented and designed on different scales within the building, and how the spaces affect people’s senses, for example, with the use of light, darkness, sound, silence and materials. Flexibility, including how rooms are designed and organized, how surfaces and the combination of spaces inspire for the users’ own activities, and how the spaces can be easily modified and used for various functions and activities. Sustainability, including how sustainable solutions have been incorporated into the library, for example, by reducing quantities of resources used, using local materials in the construction process, or using natural resources as an energy source. Learning space, including the way the library offers a diversity of approaches to education, how learning spaces support different learning situations, and how the learning spaces interact with the rest of the library. Digitization, including how digital communication and accessibility of library content are integrated into the library space, using methods that include mobile technologies, and how digitization has been used in innovative and creative ways to create experiences for library users within the library building. In addition to these six criteria, and because the prize is awarded by IFLA, each library is assessed on how it lines up with the IFLA’s Strategic Plan 2016-2021 and with the United Nations 2030 Agenda for Sustainable Development Goals (SDGs). The challenge for the judging panel is to award the prize to the library with the best approach across all the criteria. For the award made in 2018, participating libraries had to have been completed between 1 January 2015 and 31 December 2017. Entries were accepted from 1 March to 15 May. Applicants were required to complete a form with questions related to the assessment criteria (maximum 250 words per question) and to provide links to the library website and photos or architectural drawings relevant to the application. Thirty-three libraries from eighteen countries presented entries. The Award required each entry to submit written and graphic information in the form of photos and plans. Photographs and plans showing the building distribution and furniture organization were essential requirements for the judges to be able to evaluate each entry with reference to architectural quality and flexibility criteria. The international nature of the contest made it impossible for the panel to visit physically all the libraries entered, and therefore the judgement had to be made on the basis of the information received with each entry. It must be said that some entries failed to provide sufficient information for the jury to be able to evaluate the architectural quality and flexibility of the libraries in question. Having detected this problem, the panel decided to make judgements on the basis of the information received. What was evaluated was what could be seen, and no assumptions were made about what could not be seen. Some libraries might have scored more points if the information presented had been more complete. All the information was transferred to a Basecamp project accessible to all the judges. The two-phase scoring system was based on an evaluation form. In the first phase; each member of the panel made her/his individual evaluation of the 33 entries and chose a shortlist of ten. In the second phase, the judges worked as a team on the shortlists produced, communicating by email. The five finalists and the winner were subsequently decided at a meeting of the panel, attended by some panel members in person in Copenhagen, and by others virtually via Skype. The names of the five nominees shortlisted were made public on 27 June, 2018. Of the five nominated libraries shortlisted, the judges declared the Netherlands’ KopGroep Bibliotheken (School 7) to be the winner. Some of the nominees’ most outstanding features are detailed below. Biblo Tøyen, one of Oslo Public Library’s (Deichmanske bibliotek) newest additions, is a unique and innovative space, created for young people aged 10 to 15. It occupies part of the ground floor of an existing building and was designed by architect Aat Vos. The spaces have been organized with great flexibility, making it easy to redistribute the furniture to create distinct environments for different types of activities. The treatment of the interiors produced an almost magical environment, including a workshop built with two old Piaggio scooters, a kitchen in an old Volvo flatbed truck, and a variety of creative cubicles. Through extensive user involvement, the Deichman Biblio Tøyen has created a new and exciting interior design, reflecting the surrounding city and its people. The new interior shows how to bring new value to an existing building by inviting users to participate in creating their public library. The library acts as an agent for change for vulnerable young people and, through cooperation with local organizations and professional specialists, has increased accessibility for this special group. Deichman Biblio Tøyen is a wonderful example of how the impact of a library can be maximized by specializing and working together with a specific group. The Austin Central Library is part of the Austin Public Library system serving the city of Austin in Texas, USA. The 18,500-square-metre library, designed by the architectural firm Lake Flato, is located in the heart of the city next to its lake.It is a flexible and easily adapted building with a variety of modifiable spaces, providing both lively and contemplative spaces for the community. The impressive Austin Central Library is an iconic building and a landmark in the city. The building features its own energy production and rainwater system, and the airy feeling in the atrium and rooftop garden emphasizes the focus on sustainability, in both building and content of the library. The library has created a framework for lifelong learning by providing easy access to information and learning in all departments.Flexibility is the building’s key feature, which serves as a model for sustainable resource use. The Villa-Lobos library, designed by architect Decio Tozzi, is located in a park in the metropolis of São Paulo in Brazil. It occupies an area of over 4,000 square metres. Thanks to its prime location, the library serves a diverse public, from the urban inhabitants located nearby to sportspeople and visitors to the park. The spaces inside the library are open and flexible. Most of the library spaces converge to the central atrium, allowing a natural integration between the areas. The furniture was designed along modular lines and equipped with bearings to facilitate greater mobility and versatility in the use of the spaces and adaptation to different layouts. The architecture of the Villa-Lobos Park Library is visionary and courageous, creating a bright and open environment. It is an attractive place in which to spend time, and its architectural solutions make it possible to participate and feel part of the space. The unity of spaces can be observed throughout the library and contributes to a sense of space and freedom. This library is a particularly active library, whose interior design and architecture allows various kinds of activities to take place. The Tampines Regional Library is located at the former Tampines Stadium and Tampines Sports Hall in Singapore, which has been converted into a multifunctional complex with a surface area of 10,900 square metres, bringing together multiple agencies to offer a comprehensive and diverse range of services, programmes and facilities. The project was designed by DP Architects. The library occupies five floors at the south-east wing of the building, with an internal façade overlooking the football pitch. The library has adopted an open layout with fluid connections between levels. The Tampines Regional Library is an integral part of Singapore’s community hub, offering a unique combination of sports, recreation and citizen services. With its modern and inviting surfaces, its surprising and distinct rooms and flexible spaces, this library has become a focal point for the citizens of Singapore. Natural lighting, resource recycling and water efficiency make this library the platinum standard for sustainability in libraries. School 7 is located in the heart of Den Helder in the Netherlands, and is described as the living room of the city. The building, designed by Bureau van Veen and MARS Interior Architects, is a successful example of integrated design, a fine combination of new and existing architecture, maintaining the quality of old and new elements while achieving functional unity, both interior and exterior. KopGroep Bibliotheken has successfully integrated the library with its surroundings and is cooperating with the local theatre, café and university. Situated in an outstanding location, the old and new buildings create a visual and harmonious whole that emphasizes the best of both. KopGroep Bibliotheken is built according to sustainable concepts with the focus on restoration of the old building. The building has a well-structured layout with clear features for the various parts of the library, including good learning venues to support its vision of lifelong learning. The library is focused on social sustainability and offers services to increase social opportunities for everyone, a vision which is reflected in the architecture and learning space of the library. The presentation of the award for 2018 was made at the IFLA World Library and Information Congress in Kuala Lumpur, Malaysia in August 2018. The five finalists presented their libraries in a session held on 28 August. All were delighted to have reached the final stage. At the end of the session, the winning library was announced. The IFLA Systematic Public Libraries Award is loaded with promise and it is expected that many libraries will take part in future iterations. Experience so far has shown that the contest generates great interest in the winners and shortlisted libraries within their own countries and provides positive exposure for the sponsor and for IFLA. The judging panel has already identified aspects for improvement in the coming years and will stress the importance of providing detailed graphic and written information to enable the judges to fully and fairly evaluate each library according to the assessment criteria. The various IFLA sections are very grateful for the generous sponsorship from Systematic that provides a significant platform to recognise the commitment governments and funding authorities make to public libraries and the communities they serve. Images for the Deichman Biblio Tøyen by Marco Heyda. Images for the Austin Central Library were provided by the Library. Images for the Villa Lobos Library provided by the SP Leituras team. Images for the Kopgroep Bibliotheken School 7 were provided by the Library. Santi Romero, one of the judges for the 2018 awards, is an architect who began his work in 1993 at the Library Services Management Office of the Diputació de Barcelona. Since 2005, he has been the Head of the Library Architecture Unit. His work involves advising on and monitoring public library projects and works in Barcelona province; he has worked on projects for over 150 libraries. Santi has written articles and spoken at conferences, both in Spain and abroad. He has sat on the judging panels of library architecture competitions, as well as on the commission that drew up the Catalonia Public Library Standards published in 2008. He took part, as a Spanish expert representative, in the drawing up of the Technical Report ISO/TR 11219 Qualitative conditions and basic statistics for library buildings, published in 2012. Santi penned the book Library Architecture: Recommendations for a comprehensive research project. He has been a member of the IFLA Library Buildings and Equipment Section Standing Committee since 2005. Libraries in general terms are alien to Latin America and its native cultures and have traditionally adopted a Western-based design in the entire continent, even when serving communities which did not share Western values. On the other hand, traditional aboriginal spaces devoted to cultural expression and knowledge storage and transmission have been, until recently, unfamiliar and unknown to many within Latin American nations. The increased visibility gained by indigenous topics and issues during the last twenty years, and the subsequent transformation of Latin American societies into more inclusive structures, has meant that libraries were transformed as well. As slow as this transformation process might have been, several advances have been made in terms of library design and service provision. Libraries in AbyaYala are increasingly aware that they work in a land with diverse and ancient traditions. They understand that besides assessing the incorporation of latest developments, they must include in their collections and services the continent’s popular knowledge, cultural diversity, traditional formats used to transmit information, and the unique Latin American intangible heritage. They understand that “library” is a concept that cannot remain anchored in the past; that it must be deconstructed, decolonized and fertilized with new ideas and approaches, so that it can evolve. Libraries accept that to be truly communal spaces, they need to consider many different perspectives, as well as the identities, languages ​​and ideas that still exist in the continent. Developing these library-related ideas and values in an ethnic, cultural, political, social and economic space as thorny and complex as Latin America is far from being an easy job. But despite the many setbacks, some libraries developing activities in AbyaYala’s indigenous regions have achieved visibility and relevance. They gained attention after they managed to combine traditional building and space design with needed library services, all in an elegant, beautiful way. A case study which exemplifies the new approach to indigenous libraries in Latin America relates to one of the comunitecas in the municipality of Tecpán (Department of Chimaltenango) in the highlands of southern Guatemala. The comunitecas are part of the PAVA project (Programa de Apoyo a los Vecinos del Altiplano/Support Program for the Highland Neighbours) (PAVA n.d.). There are three small libraries located in areas where most of the population belongs to the Kaqchikel people, a Maya-speaking society. The libraries in addition to maintaining their respective collections offer meeting places in which communities can conduct cultural and educational activities. They also support continuing education, working closely with rural teachers. The activities held today in the comunitecas were previously implemented in small spaces provided by other institutions, usually schools. 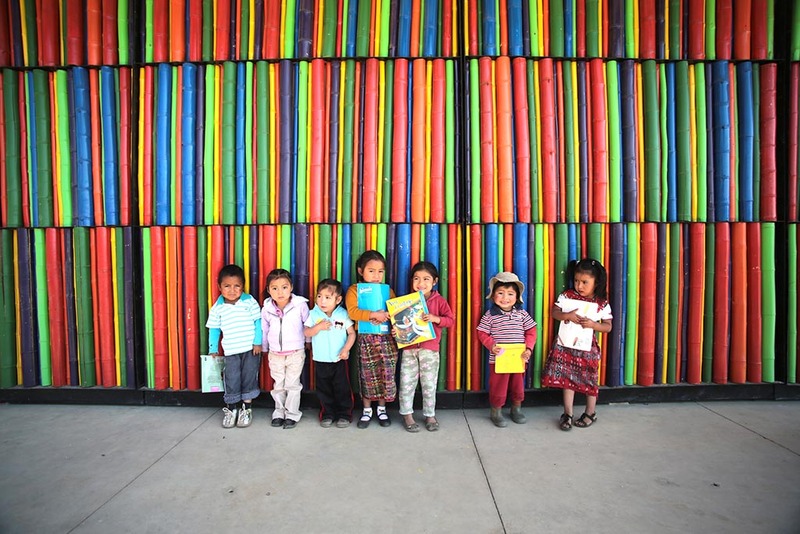 In 2013, the Guatemalan architect Axel Paredes donated to PAVA the drawings to build a library in the community of Paxixil. Although the construction is small, the structure is very ingenious, and its appearance is certainly attractive. The structure is enclosed by mobile panels made of thick bamboos, each painted in bright colours to imitate the traditional patterns of indigenous textiles. The library provides access to 3000 books and a series of training programs for some 200 people. In the last few years, the comuniteca at Paxixilhas become very famous. It has been mentioned in specialized architecture magazines, such as Domus (Paredes 2013), and was the winner of the Architecture Biennial of Guatemala in 2016. Paxixil’s Library has not been the only rural library to win an Architecture Biennial. 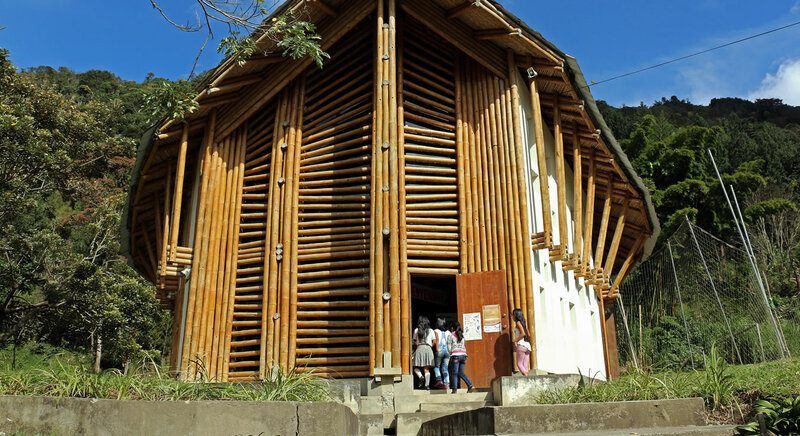 The public library “La Casa del Pueblo” (The People’s House), located in the village of Guanacasin the municipality of Inzá, department of Cauca, Colombia, obtained a similar recognition for its country in 2004. Designed by two architecture students at the request of Inzá officials, the library was built by the neighbours themselves over the course of a year. It has grounds and walls of stone and concrete, a complex internal structure made of thick bamboo, and a thatched roof made of straw. Although it does not precisely reflect the traditional architecture of the area, the design takes very good advantage of the available spaces and materials. “La Casa del Pueblo” provides many traditional library services to the communities settled in the area, some of whom belong to the Paez indigenous people. But its activities are often eclipsed by the history of its construction and, above all, by its evocative appearance. The examples described demonstrate that the initial steps regarding library services to indigenous peoples in Latin America are being taken in the right direction. There is still the problem of stereotypes. An important issue is the development of regional and national policies regarding library services for indigenous peoples. Other issues concern lack of action in ensuring editorial production of content in indigenous languages, sustainable intercultural education and a long and complex “etcetera”. The existence of libraries like those in Paxixil and Guanacas is good news and hopefully provide exemplars to be emulated in many other places in AbyaYala and elsewhere. Step by step, libraries, especially those working in indigenous areas, must become spaces where cultures and visions combine to make places of knowledge welcoming for everyone. Edgardo Civallero is an Argentinean/Spanish librarian, currently working as the director of the Charles Darwin Foundation’s Library at Galapagos Islands, Ecuador. He is also the director of the digital humanities project “Observatory of Libraries and Indigenous Peoples in Latin America”. He is a member of IFLA’s Indigenous Matters Section and has worked for the last fifteen years with library services for indigenous peoples, oral traditions and endangered sounds in languages and music, and knowledge management. At Umeå University Library located in northern Sweden, a team working in library facilities has conducted several User Experience (UX) studies to understand user behaviour and needs. The findings provided useful data and showed that many students use the spaces for lengthy time periods and that the furniture provided did not meet their needs. The results demonstrated that rethinking space planning at the Library was required. The solution was perceived to be the provision of ergonomic work stations which would improve the work environment and function as a relaxing setting for the user to unwind. The desired goal was furniture to be used for studying that would not impact negatively on the body. The end result would be workspaces that were creative, fun, useful, comfortable and productive and part of general health awareness thinking in relation to ergonomics. The team at Umeå University Library made observations and undertook guerrilla interviews which are easy and efficient. Guerrilla interviewing involves asking interviewees on the spot if they might be able to respond to a few questions. It is an inexpensive way of gaining reliable insights into user behaviour. Impromptu but rigorously planned questions seek immediate feedback into use of a specific library area or service. Best of all, it does not require extensive work in market segmentation or sampling because people are chosen randomly on the spot. Graffiti walls were also used to record the feedback from users. It is a simple and low-cost method consuming minimal resources. A query can be placed on a big flip board located in the targeted library space on which feedback is sought. Users can answer highlighted questions. Is there an electricity outlet nearby? Everyone knows that this is the most important part of choosing a study space, right? Is the room actually quiet? Does the lighting work for me? Can I easily find the bathroom or see other signs where I am sitting? How effective is the ventilation? Does the space feel safe? Are there any staff about? There are many interesting questions that could be asked, and it is important to focus on the outcomes from the beginning so that the resulting data can be easily handled. Is the ambience the major area of investigation? Or wayfinding and signage? What do Library Users Really Do? How do users move and interact with spaces and library staff? How often do users seek assistance and which library services are they using? Using the TTT method, it was observed that many students regularly visit the silent reading rooms during the day but seemed to abandon them at night, moving closer to the main information desk which is located near the entrance and staffed during all opening hours. This was an interesting observation to consider when thinking about the environment. Such observations must be followed up with interviews or other survey methods to help determine the reasons for users’ choices and to investigate why users were moving closer to the circulation desk during the evenings. The TTT method was a great way to start gathering information. It is easy to think one knows how library users behave but watching what they do often provides surprisingly new and unexpected insights. During another session watching what students were doing, a student placed a chair on a desk and then his laptop on the chair. Placing one piece of furniture on another was an interesting and puzzling choice. When questioned about his behaviour, the student explained that he was seeking to produce a situation where he could stand and work with his laptop as no adjustable desks were provided. The observation was a revelation to library staff and led to the realization that many students today think more about how they work in regard to their health. They do not wish to sit and work all day in the same position but want to adopt varied stances while working, standing or sitting, throughout the day. The Library realized that additional ergonomic work stations for users must be incorporated into the space. Careful examination of the data from the various studies of user experiences revealed that many students were sitting in the Library for more than eight hours a day and some for over ten hours. It is important to have appropriate furniture and settings for extended hours of work. More and more students wrote comments on the graffiti walls and mentioned in the guerrilla interviews that they would like adjustable desks in the library where they could modify desks for standing up to work, and then lowering them when they felt like sitting for a while. Understanding these needs led to moving beyond adjustable desks to the concept of active sitting and ergonomic thinking. New purchases were made including adjustable desks; ergonomic standing plates; exercise balls; balance plates; office bikes; and new lounge chairs and plants to provide an inviting relaxing space. Much has changed in thinking about standing versus sitting for long hours of the day and new approaches must be applied to students’ work and wellbeing. Students often have hectic schedules with intense, focused work in particular time periods. It is important to encourage everyone to be flexible in the positions they choose for studying and working and to help people choose active and fun ways of sitting and/or standing. After the ergonomic work stations were introduced, a small evaluation was undertaken to gain feedback from users. Flip boards were placed next to the ergonomic bikes and exercise balls. Very positive responses were recorded. Some comments were that the users wanted more and differently-sized ergonomic devices. Users applauded the changes in the study environment. Some comments indicated that while students did not use the ergonomic plates, desks or bikes themselves, they were glad that others could use them. Some users also took the liberty to point out that they wanted longer opening hours and that the library needed a better ventilation system. By using varied methods to observe user experiences, the Library secured the feedback needed to appreciate the library space’s imperfections and to obtain the basis for focusing on creative and inspiring improvements. The IFLA Library Buildings and Equipment Section Midyear Seminar, Innovative Partnerships: a Strategic Imperative was kindly hosted by the Library of Birmingham on 23 February 2018. David Potts, Director, Library Resources at the Library of Birmingham describes the event. The IFLA Buildings & Equipment Section seminar at the Library of Birmingham (https://www.birmingham.gov.uk/libraries) was a fantastic opportunity to learn about library design developments from all over the world. The range of libraries covered included public libraries, academic libraries, and even joint public/academic libraries. There were delegates and contributors from places such as the USA, Canada, Australia as well as the UK. It was interesting to me to hear however great the geographical distance, the challenge of meeting the requirements and aspirations of users with innovative but practical design is a constant. Another interesting trend appears to be how libraries are being named. We had presentations from libraries called The Eye, The Hive, The Word, The Diamond, The Link and The Storyhouse. Nomenclature in all its manifestations is something with which I have long been fascinated. Are there any conclusions to be drawn from the ‘L’ word being so often omitted? I’m not sure, but it is becoming increasingly more common. Delegates were invited to tour the Library of Birmingham and it was my great honour to give a short introductory presentation. Visitors are always interested in the architecture which is great, but it was also a brief opportunity for me to talk about the services we provide and the unique collections we hold, including Shakespeare treasures. As ever with events like this, it was lovely to meet colleagues with whom I have worked over the years from all over the UK and beyond. It was really fascinating to hear the varied work they continue to do in relation to library design. We were delighted to host this IFLA event and hope everyone enjoyed their experience in the Library of Birmingham. We hope to see everyone again very soon!